Rocky having been off tour for around 3 years, is now sponsored up and is now back to play the world circuit from 2010. Many professional players have attempted to break Rocky's Speed Jump Shooting World Record and despite an attempt in 2007 on Finland National TV (which was not recognized by the Worlds Academy), his record remains undefeated to date (2011). Despite, being one of the oldest players still on tour, Rocky is still going strong. Below is Rocky's Profile, during his entire career in the game. February, 2004 - Starred in movie "POOL - From Beginner to Champion"
January, 2007 - After setting a World Record for New Zealand, elected by New Zealanders, as most popular sportsman of the year, in top 10 ranking at NZ Sporting website www.nzedge.com, with Sir Edmund Hilliary elected No.2. May, 2007 - Won Hong Kong Pool Marathon, achieving 250 racks in record time, 105 racks ahead of the 2nd place getter, in a playing field of 20 players -$10,000. 11 Dec, 2007 - Successfully defended above title. Won the Hong Kong $10,000 - 250 Rack Pool Marathon. 7th to 10th June 2010 - European 10 Ball Opens, Berlin Germany, Top 32. 24th to 27th June 2010 - Won the NTT 9 Ball Championships, Indonesia - $5,000. Nov 22 to 30, 2010 - Rep NZ at the US$30,000.00 43rd All Japan 9 Ball Champs, Osaka, Japan. 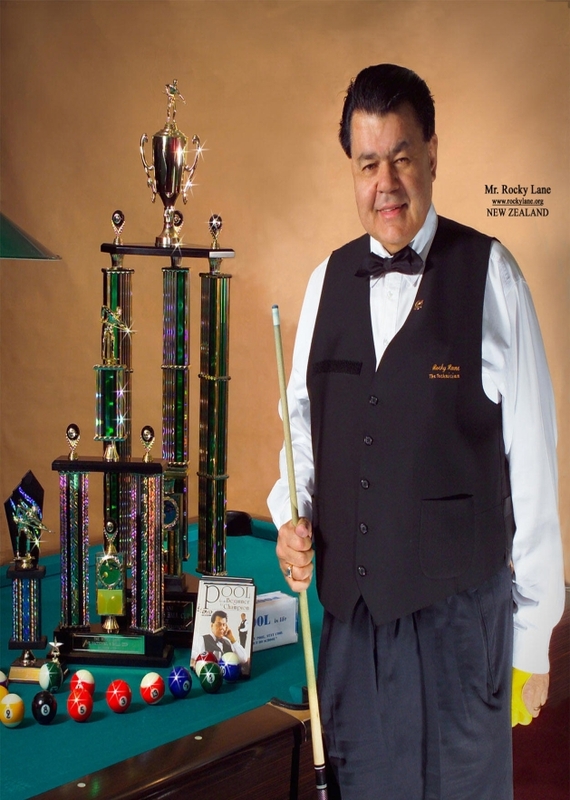 Dec 16 to 19, 2010 - Rep NZ at the US$41,000.00 Joss Turning Stone 9 Ball Classic, Verona, NY, USA. Rocky's respective World rankings can be seen at the respective tour sites for the European, Asia and the BCA AmericanTours. Other Club Events Have competed in other club league matches in Hong Kong, New Zealand, Sweden and the Philippines. Click at the top of news clippings to the right on this page, to see Rocky's Official World Record Certificate at the bottom right corner of the photo there.